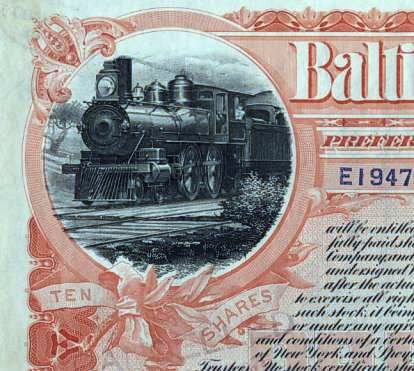 Beautifully engraved certificate from the Baltimore and Ohio Railroad Company issued in 1898. 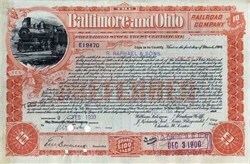 This historic document was printed by the International Banknote Company and has an ornate border around it with a vignette of a train. This item is hand signed by the Company’s Agent and Transfer Clerk and is over 109 years old. The certificate was issued to R. Raphael & Sons. Raphaels Bank, one of the oldest independent banking houses in the country, was founded by Raphael Raphael, a Dutch merchant who, as a young man, left Amsterdam and came to London in 1787. He made a considerable fortune during the Napoleonic Wars and successive generations of the Raphael family moved into public share issues, raising loans for European Governments and large transactions in American Railway Stocks (R. Raphael & Sons). The family sold the Bank in 1983 and it is now owned by Lenlyn Holdings, a world leader in retail foreign exchange.